Gold Medal paperbacks can be good or bad but they're usually not boring. Robert Kyle's The Golden Urge is one of the exceptions. Robert Kyle was a pseudonymn for Robert Terrall, about whom you can read quite a bit here, in this interesting bio and interview with his son. It sounds as though Terrall wrote some books worth reading. He wrote quite a lot. As far as this book goes, the front cover arouses a few suspicions. First, the breathless blurb comes from King Features Syndicatre. This is not a reviewer or a magazine or a newspaper. It's a syndication company that distributes varied content. So a recommendation from King Features Syndicate is kind of bizarre in the absence of any other information. Imagine seeing a movie poster with "'Best Movie of the Year' — United Parcel Service" on it. And then there's what the blurb actually says. "Best robbing-the-bank thriller since Cain's 'Double Indemnity'". Double Indemnity was a story of insurance fraud and murder, based on the real-life case of Ruth Snyder. Nobody robbed any banks. So both the origin of this excited recommendation and the recommendation itself are dubious. 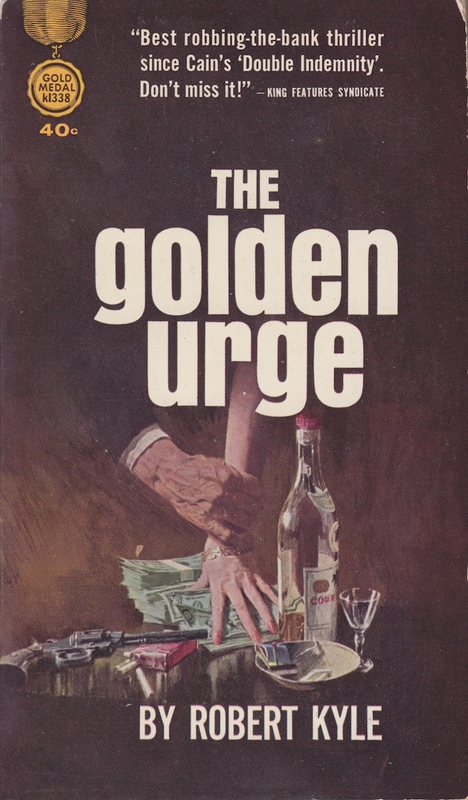 Heist novels and movies are almost always attractive to me and I was kind of hoping that The Golden Urge would be one, but it isn't. It's actually a poorly paced and tedious mixture of mystery and melodrama, with incredibly long-winded dialogue and unconvincing behaviour from its characters. The "likeability" of people in a story has never been especially important to me but I do need to have some slight interest in what happens to them. By page 78 of The Golden Urge I found myself groaning, "Why hasn't this book ended yet?" Carol Winter works at a bank. So does her husband. In the first chapter of the book he tries to kill himself. She saves him and he confesses that he's been embezzling money from the bank to pay his mother's hospital bills. Carol intends to put this right. She decides to ask her boss, the bank's vice president, for help. But this guy has actually just embezzled a much larger amount and is skipping town. Once this becomes known, an insurance investigator shows up and we follow him around while he tries to find the absconded vice president and the money. He's pretty bad at his job, doing stuff like leaving his gun lying around for anybody to take, right after the same gun had been taken from him and he'd been beat up. I can't imagine anybody letting go of their gun and such circumstances. You'd put it in your pocket or just hold on to it. He also manages to get his wallet stolen by the same young punk who takes his gun and doesn't even realize it for a long time. Not until, of course, the author needs him not to be able to identify himself to some police officers. In places you can see Kyle/Terrall straining for depth that isn't here. "Fessenden had a wall-to-wall carpet in his office, comfortable leather furniture, a little fireplace that no longer worked—the old chimneys had been cemented up before DeAngelis was born." This isn't a great sentence. And when I got to the chimneys that had been cemented up before DeAngelis, the insurance investigator, had been born I thought, who cares? Later on we learn that DeAngelis's boss is "a fat man shaped like a teardrop, fast on his feet for a man who rarely moved behind a desk". The fat man who's surprisingly fast is a cliche and a human being can't be shaped like a teardrop. That doesn't work. Another simile that falls flat is when an old man "straightened painfully, his knees crackling like heat lightning". Lightning is silent, of course, and heat lightning in particular is sometimes known as "silent lightning". The overall impression is of a book written in one sitting, for money and without much care. The wrapping up at the end is particularly abrupt and actually borders on the offensive, veering unexpectedly into some unwelcomely sadistic and gruesome territory. The first line is "The apartment seemed a little too neat, as usual".